Reduce Purge / Dry Times Maximize Vapor Exit Path With Cascade’s MAXEVAP Connection Kit! Cascade’s CVO vacuum ovens offer two different vacuum oven connection points. The standard connection is a 3/8th dia barb located at the rear of the oven. When using the standard exit point and connection size all the outgassing material must find its way out via the 3/8th dia exit hole and interior plumbing and vacuum lines. For large batch, production level processing, pumping off this smaller 3/8″ diameter plumbing and lines can slow the process down. For even faster evaporation, purging or drying consider upgrading to the MAXEVAP connection kit. The MAX EVAP connection kit secures to the ovens’ 1” dia KF-25 port located on the back center of the chamber. 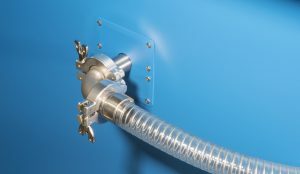 The MAX EVAP connection never reduces flow by continuing with 1” diameter vacuum rated clear lines, a 1” dia KF-25 side mounted vacuum valve and KF-25 fittings and hardware. The ovens’ KF-25 port can also be used to run temperature feedthrus, or monitoring sensors inside the vacuum chamber during processing. MAX EVAP Connection Kit can be installed in the field as an add-on or upgrade. The connection kit has everything you need to connect directly to the Cascade oven. Current models of the TVO and CVO vacuum ovens have pre-set hole patterns to mount the upgraded vacuum valve on either the left of right side of the oven, for the best workflow design.